celebrate Thanksgiving in a vacation rental with a hot tub but this year when I sent the email to over 60 people only 4 people responded which wasn’t enough to cover the cost of a vacation rental at a reasonable price... so Emily and I were left to fend for ourselves. I had been really busy with work and school projects so I kind of left it up to Em to decide what to do. She came up with a great idea... a dinner cruise on the Portland Spirit for Thanksgiving. surprised to see several families and a wide range of ages. As we boarded the crew took a photo of us that we later bought because it really was a good photo of us for a change. 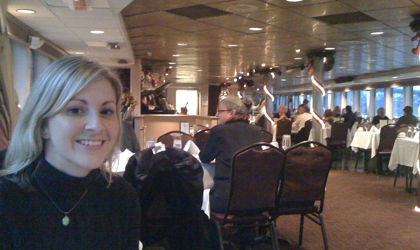 We got a great table near the bow of the boat on the 2nd level and were treated with a piano player and a lively lyrical crew who seemed to all sing at least one Christmas carol. Our waiter was Tom and I swear he wasn’t a day older than 16 but he was very good with us. He told us he was working a double shift that day as well so I made sure to leave him a big tip. (BTW... two days ago was my last day at Ruby Tuesdays!!!... I left because I didn’t need the cash anymore or the stress, although it really was a good job while I had it). We cruised all the way down to Port Orford on the Willamette which took us from 4:30 to 7:30pm. The food was fantastic with shrimp, salmon, and the usual thanksgiving fixings as well as a roast. I pretty much gorged myself as it was all you could eat. A bottle of wine and several drinks later we docked and headed back to the hotel for a relaxing evening with a bottle of champagne we picked up. The hotel room was super nice and it was a great holiday with just the two of us. Good job planning Emily!